Whether you see your kitchen as a place to toil over a hot stove or to tantalize some taste buds, kitchen windows bring much needed natural light to make any task easier. 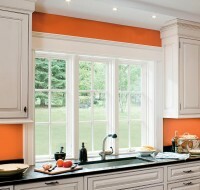 And with stunning design options, your kitchen window can also be the focal point of the room. Opening a window while reaching across kitchen counters can be difficult. Casement or awning windows are well suited for this situation. With crank and lock both within easy reach, you get quick access to breezes. Today’s stoves feature beautiful exhaust covers and decorative backsplashes that enhance the room’s design. When flanked with windows on both sides, there’s a new hot spot in the room. A breakfast nook with windows that stretch from floor to ceiling brings the outdoors in and insulated Low-E glass keeps things comfortable. 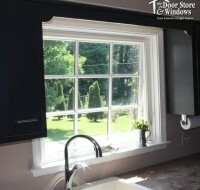 Installing a window over a sink was the architect’s way of making the drudgery of cleaning dishes a tad more enjoyable. Take it a step further with multiple windows and you’ll feel like you have an outdoor kitchen. 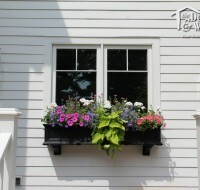 This homeowner loves to enjoy colorful flowers, but you could just as easily have an herb garden in this window box. Open your windows to the smells of the outdoors, flowers and herbs. 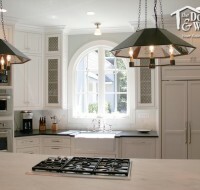 Choose a unique design like this arch to provide a visual spark to your kitchen area. Many other shapes and grille patterns are available to meet your design aspirations. For more design inspiration, contact one of our design consultants at 502-896-171 or fill out our contact form. There are a number of different window styles available – casement, double-hung, picture and more – each designed for a particular use. But how do you use the different styles together without your house looking like a hodge-podge of window openings? We can help. Can You Find The Four Different Window and Door Styles In This Picture? While all of these windows and doors look very similar, this photo shows four different styles of window/door in use – casement (at left in kitchen), double-hung (corner above lamp), and picture windows (next to double-hung) along with sliding doors (next to picture window and far right). Notice how well the different styles of windows and doors maintain the “two-over-two” grid pattern. Watch the video at right to find out more about how the architect put the appropriate style of window/door where it was needed. The original windows in this home were a mish-mash of grid pattern sizes and muntin usage that didn’t match the proportions of the house. Adding external muntins, changing to a larger grid pattern size and adding muntins to the half-round windows makes this home look more stately. 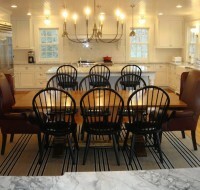 Call one of our design consultants at 502-896-1717 to get started on your project. We can help you transform your home with new windows or doors.